“Drop it!” This time she slapped him. Still dazed, he turned from the bloody mess in front of him and looked at her. “Drop the gun. We have to go. Now!” The force of her command was sufficient for him to obey. He was too stunned to do otherwise. “Yes.” She didn’t stop moving. He hesitated only for a moment before hurrying to catch up to her. The fury on her face quashed his desire for an answer. He looked down at his feet, invisible in the gloom. She turned and resumed walking quickly down the tunnel, never once looking over her shoulder to see if he was keeping up. For his part, he tried to put his feet where she did so that he wouldn’t trip. But he could only guess where she stepped in the dark, so he had to pick himself off the ground several times before they came to a door hidden in the wall. In truth, it was only the darkness that hid the door, but it was sufficient. He didn’t notice it until she had opened it, allowing a dim light to spill out. Despite the meagerness of the light, his eyes took several moments to adjust. The room was small. A cot, a desk, a cooler, and another door were all that waited inside. The lone light bulb could not brighten the dull grey concrete of the walls and floor. “Oh.” Her stony expression cracked, distress showing through. Gone. The feel of the gun in his hand, the jarring kick after pulling the trigger, it ripped everything away. “Which is?” This whole thing seemed too absurd to be real. He trusted her, though he couldn’t say why. He looked around the room. A cot, a desk… He couldn’t remember how he got here, but this woman was directing him to a door. “Yes, that door. Go through it. You can only take two things with you. One is my face. Remember it. Trust it.” He looked at her face. His mind had trouble hanging on to what it looked like, but he forced himself to memorize it. “The other is the following information: you killed someone. They will try to arrest you, stop you. Don’t let them. Know you have to run as soon as you see someone representing the law. Run. Find me. We will get you back. I will bring you back. Now, go!” As if she had some power to command him, he jumped up and walked through the door. He was on a street with office buildings. The sun was high overhead. Where was he going? Of course, back to the office after lunch. The afternoon meeting loomed large, threatening the rest of his day. Boring, useless, but mandatory. As he headed back to his office, he noticed a police officer across the street. Was the cop staring at him? It made him nervous, and he began walking more quickly, while trying not to look suspicious. He didn’t hear anyone chasing after him but didn’t dare turn around to look. Reaching the door to his building, relief settled in. He turned to see the officer right behind him, his hand on his gun. He couldn’t go. But why? He hadn’t done anything wrong. A voice screamed at him to go, to run as fast as he could. He obeyed, running away, shoving past people. The cop yelled after him, but he ignored it, kept running. Murder. They thought he had killed someone, and he needed to get away. “Very well. Follow me.” She turned and walked quickly back down the stairs. He followed, expecting to hear police behind him any moment. Her scream pierced him, and he turned to look at her. Her eyes were full of pain and pleading. Throwing the gun to the side distracted the vagrant enough for him to reach the man and knock him to the ground. A shot sounded, but it missed wide. The vagrant lay stunned on the floor. “Quick! Follow me!” He heard the relief in her voice over the urgency. She led him down a tunnel to a door in the wall. He couldn’t imagine how she knew it was here. Once through, he found himself in a small room with few furnishings. A cot, a desk, a cooler… And another door. “What is happening?” he asked, after sitting on the bed. She grabbed his hand, a tenderness he didn’t think was possible. He got his first real look at her. She smiled and threw her arms around his neck, pressing her lips hard against his. How long had it been since she had last kissed him? Too long. After moments or minutes, she sat back and continued to smile. Years ago, when I was supposed to be working on my dissertation, I wrote a novel. As with many of my stories, it was based on a misunderstanding of some song lyrics. I’m okay with that. It doesn’t matter if the story properly represents the song. It gave me the idea and I run with it. Anyway, while I did finish the dissertation, I also finished the novel. But the novel needed work. Lots of it. My teaching career began shortly after that, and I never made the time to fix it. This morning, my muse was being stubborn. I was up very early, and I thought I could knock out another piece of flash fiction. But no character or story presented itself for the writing. Instead, the only thing I had was the first scene from that novel. And I knew the rewrite for that was going to have to be massive. I couldn’t simply fix the words, I needed new ones. So I wrote the first two pages. Because I’ve written the story once already, I have the plot. But I think I have better words this time. The click of his shoes on the sidewalk echoed through the night. It annoyed him. Insomnia made every annoyance worse. Even with the sound grating on him though, walking was preferable to standing still or lying in bed staring at the ceiling. If only some other noise would offset his own gait. However, the darkness held no relief. It gave him a place to escape his oppressive bed, but Greg Stillman would find no other succor in the night. He had to be okay with that. A mist hung over the streets, obscuring even the few pockets of light provided by the occasional working street lamps. Normally, even at night, a few people would be out wandering to various destinations. But the damp had driven them indoors, and he had the night to himself. Even cars weren’t venturing out. Shivering involuntarily, he drew his coat in tightly. It had ben a warm April so far, but the mist brought with it a chill too strong for his jacket to keep out. It wasn’t enough to drive him back to his apartment though. There the darkness was close, threatening. Outside the darkness had the whole world to expand into and didn’t threaten to smother him. A crash followed by a moan coming from a nearby alley startled him. The interruption left him puzzled: what should he do? Habit told him to finish his walk. There was little sense in wandering into a dark alley. Yet an uncharacteristic curiosity held him in place. Something – someone – was back there. Perhaps he ought to check. His feet itched. The walk had been stopped short, and his body was anxious to get back to it. Overriding the demand, he cautiously took a few steps toward the sound. Every muscle in his body ached as if to convince him this was a mistake, but the pull of his need to know what was happening was too strong. Another few steps, and he thought he could make something out. His eyes had already adjusted to the little light on the street, but the dark here was deeper. It took him a few moments before he could see the leg for what it was. Horrified that he had found a dismembered leg, he inched closer. But he had been wrong. The leg was not severed. Debris had fallen on the woman and obscured her from view at first. He could not immediately tell whether she was alive. She looked like she had no right to be. Her clothes were ripped and dirty. 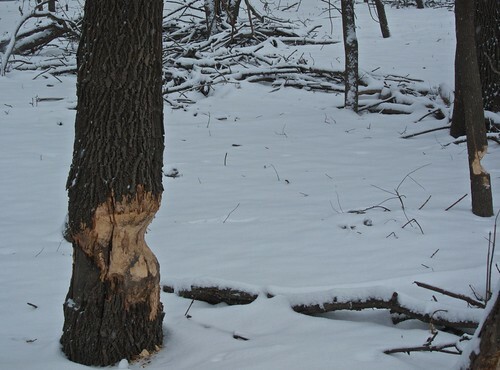 Cuts and bruises covered nearly every inch of skin that he could see. As he took a few more steps, a soft moan escaped her. So she was alive, though how was still a mystery. For how long she would survive was yet another question. She needed help immediately. His cellphone was on the nightstand next to his bed. He hated bringing it with him on these walks. Now he cursed softly at his disdain for carrying it. There weren’t any working pay-phones in the neighborhood, perhaps not anywhere in the city. Where was the nearest hospital? Several blocks, but she looked as though she couldn’t weigh much. He picked her up as carefully as he could and began walking. Even her 120 pounds or so began to wear him out before he reached the hospital. Still he managed to get there without jostling her too much. As soon as the receptionist saw her, she called a nurse over. The nurse helped him set her down on a bed. “What happened to her?” She didn’t stop working on the unconscious woman while she waited for his answer. She gave Greg a skeptical look. I rewrote the prologue for my novel The Mage. I think it does a better job of setting up the story. Stawal knocked on the door. The house stood on the cart path through the village as did most of the buildings. It was nothing so large as the Northern cities he was used to, and he felt out of place. Still, his mission took him where it would. He hoped to conclude his business in the South quickly so that he might make it to Siridor on time. That was a proper city. “Terrgat,” Stawal corrected automatically. He had had this conversation many times in recent weeks. “Never heard of ’em.” The ice in her stare seemed out of place in this warm climate. This was going nowhere. No one had answered at the house he had been directed to. Either the innkeeper had lied, or the family had moved on. This woman wasn’t going to help him. This far South, people seemed to forget the dangers of magic and how the Terrgat had protected them all. The war, over for centuries, was too long ago and too far away. She was right; the Terrgat had no place here. She hadn’t waited for another question; the door was already shut. Finding the girl seemed less important than his other mission anyway. Siridor was weeks away. He may as well head there. Taking one last look at the nearby buildings, he found himself approving of the decision to stay out of the South. The Northern cities were more to his liking. I woke up to snow. Enough had fallen that the grass was finally covered. The street and sidewalk, too. It finally looked like winter. And still it came down. 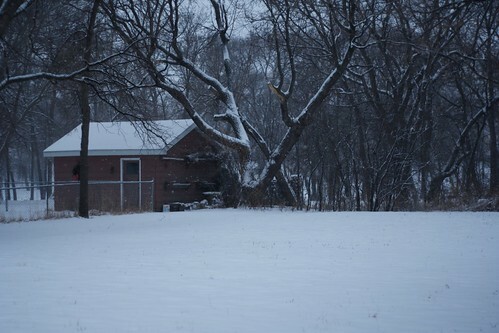 It was light, so I didn’t expect a great deal of accumulation. Yet it was more than we had had, and I was thankful. I had to do a few things. Shower, for one. And then my weekly trip to the grocery store. I was afraid it would stop before I could walk in it, so I went as fast as I could. 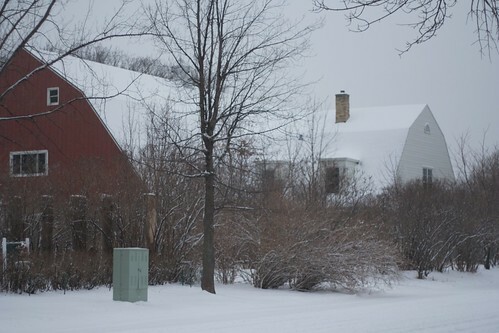 The music in my car – my music – seemed to compete with the snow for my attention, so I turned it off. The groceries bought and put away, I grabbed a quick bite to eat and headed out the door with my camera. Even this felt like too much of a delay. Still, I wanted pictures of this, so I made the time. I took some pictures on the street, and then headed down by the river for a few more. Back up to the house, I took a scarf and my smaller point and shoot (with lots of manual control), then I set out for my walk. 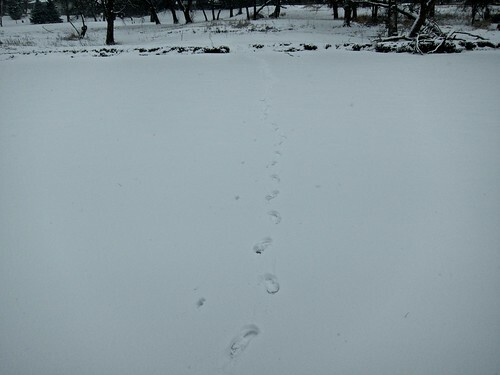 Walking – especially in winter – was the very first form of meditation I ever practiced. I didn’t know it then, and I would have used different words to describe it, but looking back I recognize it as meditation. And it wasn’t long before my spirit guide showed up to share the experience. She was quiet for a long time, letting me feel the snow on my face, under my feet. I saw a slope that led down to the river, and I nearly took it. Too many snowblowers and cars for my liking up on the road. I was reminded why I used to go walking at night. As I neared the slope, I saw a father watching his kids sledding down. They were giggling and whooping. I was a bit envious of their joy and innocence, of a childhood lost too long ago. My spirit guide did not chide me for self-pity, so I did. I did not begrudge them their fun. Not wanting to interrupt, I continued down the street a ways. Before long, I came across another slope down to the bank. With the laughter of children at my back, I stood right next to the river. After a few pictures, I decided to walk along the bank rather than climb back up. The ground was uneven, and some trees required detours away from the edge, but it was quiet. Except for the distant hum of cars on the highway, the only sound was of my breath and the quiet crunch of snow under my boots. Periods of big fluffy flakes gave way to moments of very fine grains and then back again. But it never stopped. 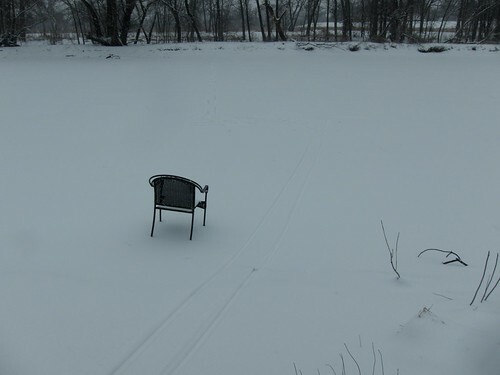 Further south I came across a chair right on the river near the bank. Thin ruts in the snow came across the river and up the slope to one of the houses. I thought them too narrow to be made by skis but later convinced myself (with other evidence) that they must have been. At that moment, I wanted to walk across the river myself. My spirit guide, ever present, was still silent, leaving the decision up to me. I thought it foolish to risk drowning. We continued south sharing thoughts and feelings. I felt bad having brought my phone, but she pointed out that I was not checking it and the few status updates were probably a good idea. Since I had told no one where I was headed, the status updates would provide clues as to where to find the body if something happened. A chuckle. No one else would likely find that funny, but we did. She was serious, I knew, but she laughed with me, too. I thought we might talk through worries and troubles, a common enough occurrence during these encounters, but she avoided it. Later, she explained that today was just for walking, for reconnecting to the world. After a bit more time and distance passed, I resolved to cross the river after all. Perhaps it was foolish, as I had seen no other tracks crossing it. But it has been very cold these past few days. I just knew, suddenly and without a doubt, that I would very much regret it if I didn’t try. 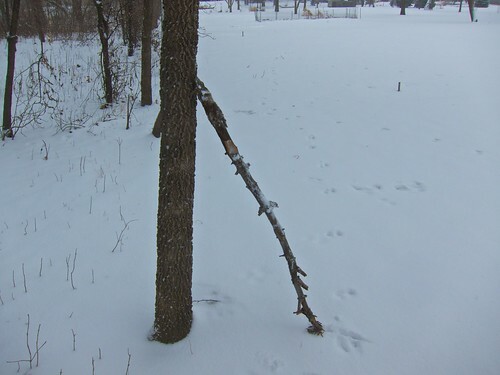 Looking around, I saw a fallen branch that appeared relatively straight. I broke off smaller branches on it. When I was finished, it wasn’t longer than five feet, shorter than my preference for a staff, but it was sturdy. Using it to probe the ice in front of me, I started across. It was slick under the inch or so of snow. While it was solid, I very nearly slipped once or twice. My makeshift staff kept me upright and helped me up the bank on the far side. Now I was near a bike/walking path in Fargo, one I had ridden on many times during the summer. I stayed off it, walking as much on the edge of the bank as the brush and trees allowed. The handful of skiers and joggers, and even a cyclist, were more intrusion than I liked, but they were few and far between. When we came up across the old power plant on the other side, I decided to cross back. The dam was not too much further, and I worried that the ice might not be quite as solid. So I slid down the bank and slowly made my way back to Moorhead. I decided to continue traveling along the bank rather than climb up. I was not ready to reenter the world dominated by human beings. I would know when I was close enough to my neighborhood to climb back up. After some time, I came to a small wood. I knew roughly where I was, but the wood was bigger than I realized. I stopped us and asked the trees for their leave to enter. She pointed out that I had no way of knowing whether they were even awake. It’s true, I replied, I am of the air, the wind my home. But water gave me safe passage today – twice! And it seems only proper that I ask these creatures of the earth for their permission. After all, if they are awake, it would be impolite to enter their home without asking. And if they slumber deeply, what does it hurt? She smiled, and we entered. We made our way around downed trees, refusing to step on any. I took but a few pictures, and then only after again seeking permission. The trees seemed to tolerate my presence, despite the elemental differences between us. 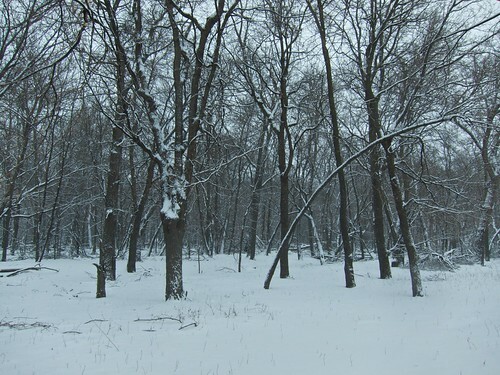 As I cleared the wood, I knew I was near where I had taken pictures a few hours earlier. I wanted to continue, but my body balked. I left the staff with his cousins. I thanked them for safe passage and him for his assistance. My spirit guide smiled again, and we made our way up the slope and home. Just enough moonlight entered the window to brighten her bare shoulder. Hugging her pillow, she slept on her belly, the sheet coming halfway up her back. Propped up on one forearm, he watched the barely visible rise and fall of her breath. He wanted to reach out and touch her back, but he was reluctant to disturb her. Should he get up? Sleep had abandoned him for the night; if he wasn’t going to rouse her, there seemed little point in staying in bed. Yet he lingered. It was becoming harder not to reach out and trace her shoulder blades lightly with his fingertips, to caress her skin. He forced the urge away. She needed to sleep. To break the spell of the moonlight on her back, he looked at her face. Her short reddish brown hair only partially covered her expression, though it was tousled from the way she had fallen into the bed. A hint of a smile on her lips fit the round curve of her cheek perfectly. Her face was made for smiling, he decided. Now he wanted to brush her cheek with the tips of his fingers, an urge no better than the one to caress her back. He almost decided to wake her just so he could touch her, but still he resisted. Instead, he resolved to get out of bed, if only to distance himself from the temptation of her. Crawling out from between her and the wall was tricky, but he managed not to wake her. There was a chill in the air, so he slipped his shirt and pants on quickly. She shivered slightly. Carefully, he lifted the sheet off her back in order to pull it further up and cover her shoulders. Now his hand did brush her shoulder, and he froze. Her smile grew bigger, but she stayed asleep. Relieved, he gently let the sheet wrap her safely from the cool air. Before he could make any other mistakes, he left the room. …The door of the apartment closed, and he looked up from the laptop screen before him. His roommate had walked in. She smiled at him, her cheeks growing rounder. Her short reddish brown hair framed the image perfectly. As she closed her bedroom door, he sighed. He turned back to the computer, deleted the file, turned it off, and walked back to his own bedroom. Applause filled the hall. The speaker smiled and nodded his head in acceptance. The crowd began filing out, chatting with one another as they left. He had clapped politely when everyone else had so as not to appear rude, but now he stayed seated. He had come alone and knew no one. In fact he had no intention of coming to this lecture. None of it made any sense, as though it had been in another language. He had entered the wrong room and felt awkward about leaving, so he had chosen to stay, listening to a presentation he did not understand. He heard the door shut, announcing that the last of the audience had filed out. A couple of people had already led the speaker out a door at the bottom of the lecture hall. Lingering a moment longer, he wondered where he should go next. A voice interrupted his reflections. She was seated a few rows back, almost directly behind him. He had to twist his neck to see her, which was why he hadn’t noticed her earlier. The seat wasn’t made to be sat in sideways, but he managed to turn part way to see her better. Her dark hair framed her face, but glare on her glasses obscured her eyes. “No. No. Nowhere to be. I’d like to get a cup of coffee.” They stood and met at the top of the stairs that led to the main exit in the back of the hall. When they reached the door, he opened it and held it for her. She smiled again, pulled a small gun from her coat, shot him once in the heart, and quickly walked away. As his life quickly seeped out of him, he found himself wishing he knew what the lecture had been about. The room was finally quiet. The screaming had been painful to listen to, but now it was over. She sat where she had collapsed, hugging her knees to her chest. The thin nightgown hung on her body and provided no comfort from the chill. Would somebody come? Had they heard the screaming? Maybe they wanted the screaming. For all she knew this was part of some elaborate plan. She had no idea where we she was. The room looked familiar, but she couldn’t remember seeing it before. Presumably, it was supposed to disorient her. If so, it had worked. In spite of the disorientation, there was some comfort, too. That couldn’t be intentional, could it? Probably not. The screaming hadn’t been intended to make her comfortable, surely. So where was the feeling of comfort coming from? She could not say. Nothing happened for a long time. The room didn’t change. She did notice it had a bed and a nightstand. The sheets on the bed were twisted and chaotic. The lamp had been knocked off of the nightstand, but she didn’t replace it. In fact, she did not move at all. Fear about who might be watching, what they might do to her, kept her paralyzed. From where she sat, she couldn’t see much else. The door was on the other side of the bed, but anything else was hidden from view. The door was open, she realized after more time had passed. Beyond was darkness, which held nothing but terror. She dared not leave, even though she was clearly being tempted into it. But she had enough of her wits about her now to recognize the trap. Still, it taunted her, threatened her with blackness. Finally they came. Men in blue uniforms. She did not recognize them, and they ignored her. Another taunt, she thought at first. Then she saw the body. How had she missed it before, when it lay just feet from her? They hovered over it, appeared to talk to one another. Why couldn’t she hear them speak? The scream had been clear enough. Had it deafened her? Their lips moved, she was certain. But no sound reached her. More people came. Different clothes, but they also stood around talking, discussing something beyond her hearing. No one paid her any attention. They seemed upset. Had they killed this person accidentally? Had something gone wrong? Had they been sent to torture this other, only to find them dead? It slowly came to her that the body had been the source of the scream. Yet more people came in; these brought a stretcher. Carefully, they lifted the body onto it. It was a woman. She too had been wearing a nightgown. Suddenly, their voices reached her ears. For just a moment, she knew where she was as her bedroom came into sharp focus. Her face stared back at her from the stretcher. Then the world went black.